Is it the Aboriginals, the first owners of this land? Is it the “first” people who discovered this land and created something out of nothing, the convicts and the people brought here by the English government? Or is it the people Afghan Muslims who came here prior to the English settlers, to trade with the Aboriginals and marry them as well? What we are taught in schools all across Australia is that after the Aboriginals, the first people to discover this land and interact with the Indigenous people of this land where the English settlers brought here by Captain Arthur Phillip. It is a white washed version of Australian history that completely, ignores the fact that Afghan Muslims and Indonesian fisherman came here is 1650, more than 130 year before Captain James Cook “discovered” Australia. According to Melbourne’s Monash University, these people were Australia’s first successful attempt at relations with the Aboriginal and Torres Strait (ATSI) people, which was fair, and there was no racial superiority, or policy. One name Australian history has forgotten is, Monga Khan. He came here as a Cameleer in 1895 helping improve trade, and aiding those that came to explore Australia. Many of these people have become forgotten in Australian history and they need to be revived. 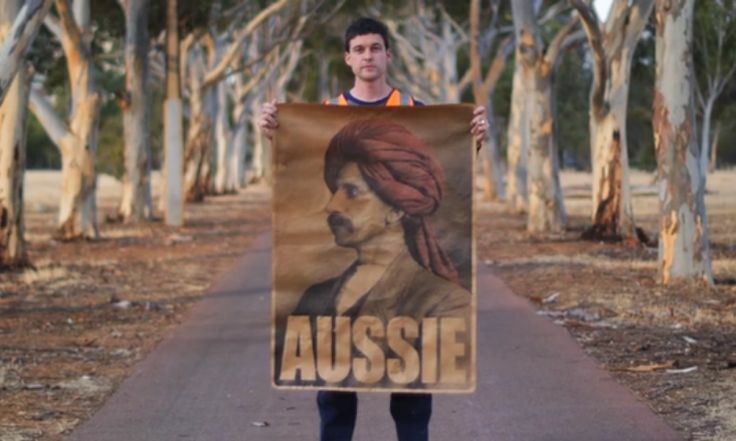 With Peter Drew’s informative yet simple posters it allows us as Australians to really question what it really means to be an Aussie and what are our values and morals as a multicultural country.